It creates a breathtaking experience inside the Mercedes E400 Coupé. The feature comes standard on the E400. The new Mercedes-Benz E400 Coupé is a terrific car. We sampled a $US90,000 tester at Business Insider and were blown away. 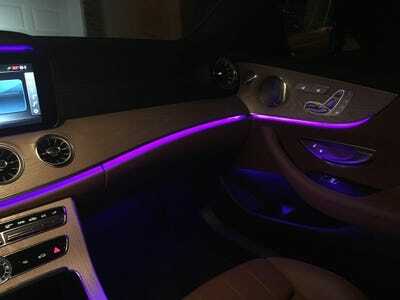 The E400 has quite a lot going for it, but one of the real show-stopping features is the ambient interior lighting. The system allows owners to adjust the tones using a slider that moves through the colour spectrum, providing much more subtlety than what you might find in other vehicles, where the colours are pre-loaded. Owners of the E400 can also change the brightness and the intensity. The Merc’s ambient-lighting is just the latest example of a significant trend in luxury cars: creating a soothing and enveloping, customisable environment inside vehicles. To a certain extent, the trend has been influenced by smart devices and their numerous customisation options. The trend is trickling down into cheaper, mass-market cars and SUVs, but not with the same rich drama we enjoyed in the E400 Coupé.